Entangled Loggerhead - Quite a Journey! 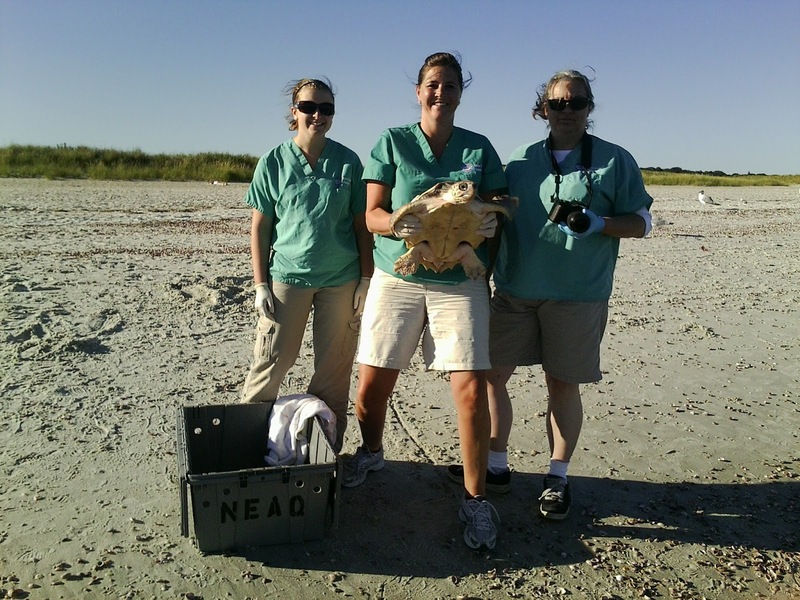 Last week we responded to a small loggerhead that was caught off a dock in Hyannis. This sea turtle had somehow managed to get itself wrapped up in the line of person that was fishing for sea robins. 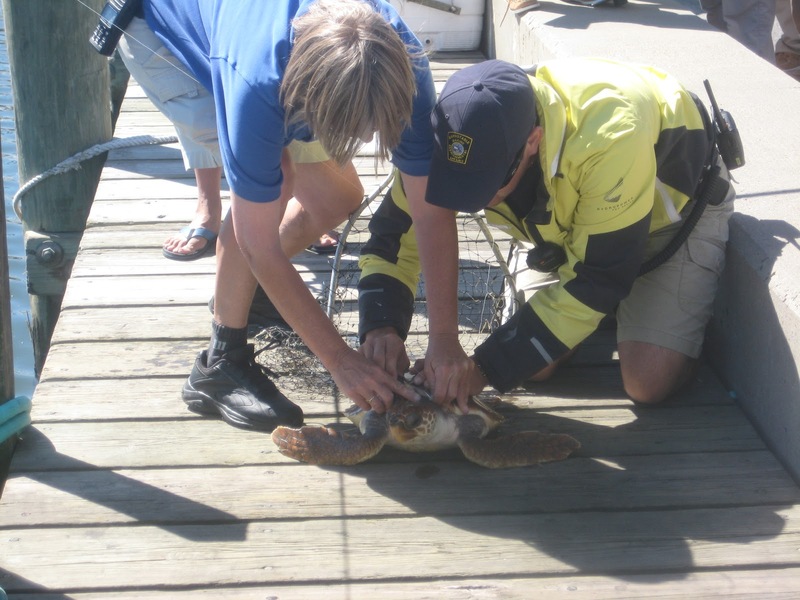 Once the turtle was disentangled, the responders on the dock were still unable to find the hook. The bottom of the inconel tag found on this turtle's right front flipper. ﻿Even though no lines were visible coming from the turtles beak and upon examining the oral cavity we still did not find any abnormal items. 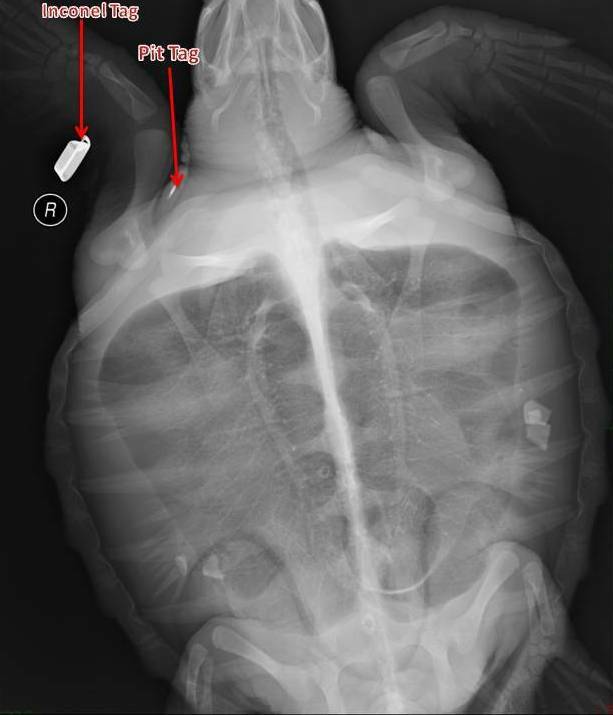 We still decided the safest thing for Rosie was to do an x-ray and make 100% sure the hook had not been ingested, better safe than sorry! Upon arrival to our Quincy facility we scanned and located a PIT tag and recorded the unique serial number. 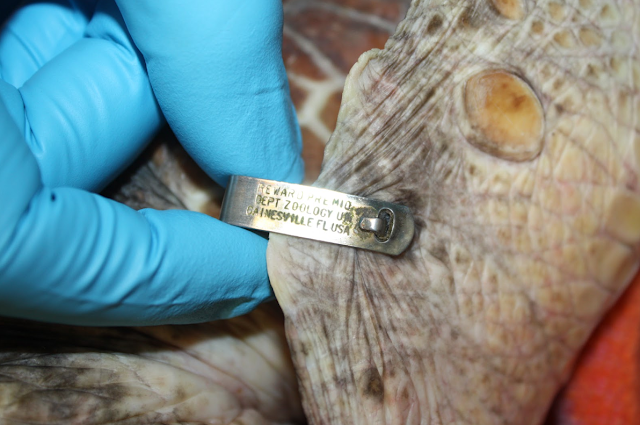 With the tagging information we were able to send it to the cooperative marine turtle tagging program and see where this turtle came from. Within a matter of minutes we found out our turtle had been raised in Galveston TX by the NOAA lab. 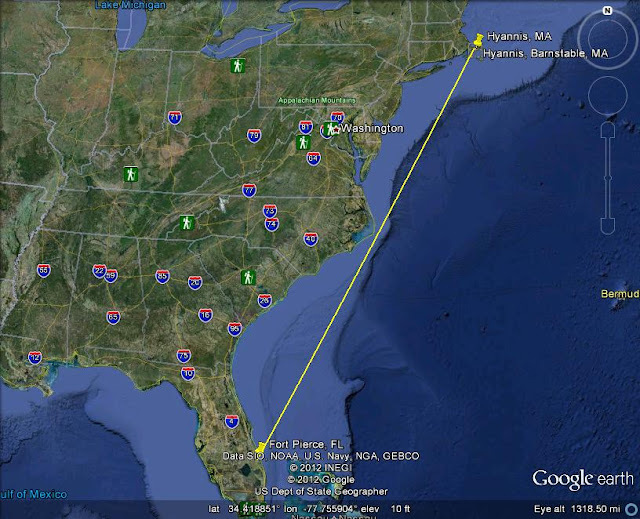 It was released from Ft. Pierce FL on July 2nd 2012. That means this little turtle swam ~1,000 miles in about 9 weeks! Image of a straight line journey. Quite a long way to travel in such a short time. The x-ray of Rosie. You can see the tags in the turtles right flipper. You can also make out in the GI that the turtle has been foraging successfully on some sort of shellfish or crustacean. 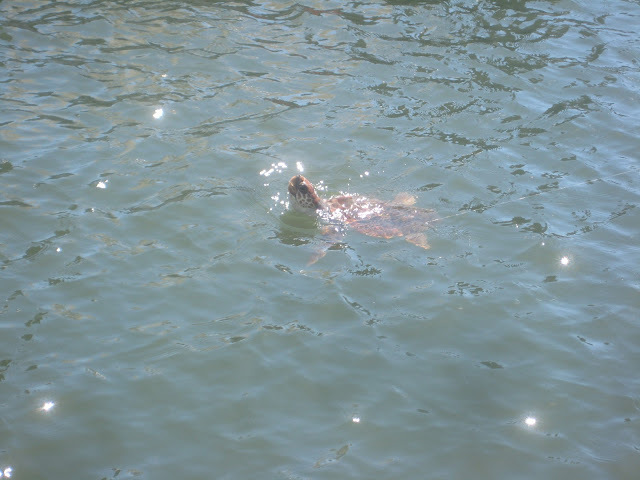 We were able to get the turtle back in the water by late afternoon! Getting ready for release. 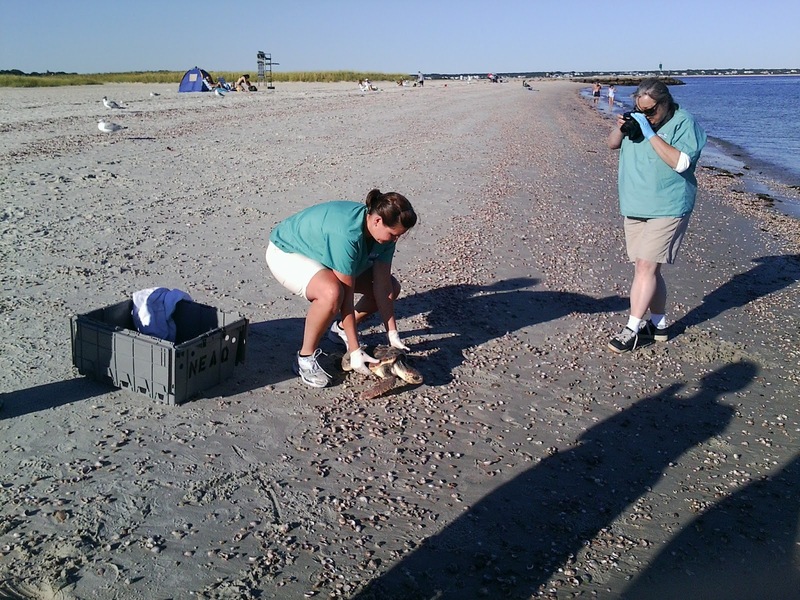 Three of our excellent volunteers: from (L) Sarah Buttermore, Jane Kettendorf and Diane Whitmarsh. ﻿﻿﻿Coincidentally, The Riverhead Foundation also brought in a turtle that had been caught by a fisherman in Brooklyn on the same day as our turtle. Their turtle was from the same NOAA lab group as this one. Unfortunateley, Anchor did have a hook in its esophagus. Check out more on their turtle here.